The January–March 2018 issue of NGS Magazine has been mailed to members and is available online in the Members Only section of the website. 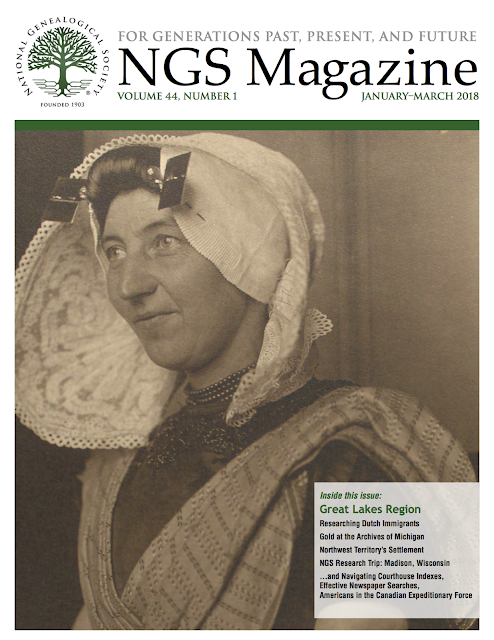 In celebration of the fortieth NGS Family History Conference in May in Grand Rapids, Michigan, this issue explores the history, people, resources, and repositories of the Great Lakes region. A large concentration of Dutch immigrants settled in this area in the nineteenth century, and the conference features eight sessions on Dutch genealogy. In this issue, Yvette Hoitink delineates their reasons for emigration, methods for researching Dutch immigrants in American records, and resources for research in Dutch records. The Archives of Michigan is the repository for Michigan state and local governmental records and the home of the Abrams Foundation Historical Collection, one of the larger genealogical collections in the United States, with many materials beyond Michigan’s borders. Kris W. Rzepczynski describes the Archives and the Abrams Collection as well as the digital resources on the Seeking Michigan website. Created by a federal ordinance in 1787, the Northwest Territory included all of the land in the current states of Ohio, Indiana, Illinois, Michigan, and Wisconsin, and part of eastern Minnesota. Kathy Petlewski’s column explores the settlement of the area and genealogical resources for the early period. Registration is now open for NGS’s guided research trip to Madison, Wisconsin, in August. 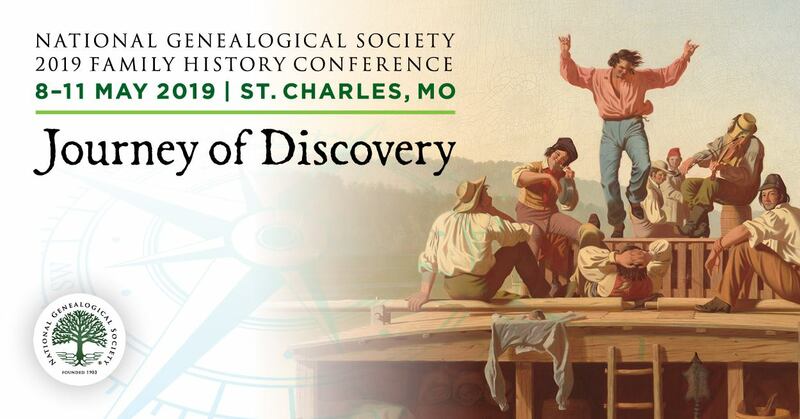 Pam Stone Eagleson shares some of the discoveries she and others made as participants in the inaugural trip last year, in the Wisconsin Historical Society and the Max Kade Institute. Two articles continue the search strategies theme featured in the last issue. Kimberly Powell provides a guide to unusual and sometimes complicated indexing systems used in many courthouse records. Many of these indexes have been digitized, and an understanding of their organization can help with locating records. Mary Kircher Roddy reports on the reasons names may be spelled differently in newspaper databases, ranging from reporters’ misspellings to inaccuracies resulting from optical character recognition systems. Searching for incorrect spellings can lead to relevant articles. During World War I, fifty-three thousand men with a connection to the United States enlisted in the Canadian Expeditionary Force, including both Canadians and Americans living in the United States and American-born residents living in Canada. Michael Strauss outlines the numerous records that survive. In their columns, Jordan Jones discusses the benefits of note-taking software, Diahan Southard gives tips on communicating effectively with DNA matches, and Claire Prechtel Kluskens presents an example of unusual records in the National Archives. copyright ©2018 National Genealogical Society, 6400 Arlington Blvd, Suite 810, Falls Church, VA 22042-2318. http://www.ngsgenealogy.org.